As Myanmar or Burma, as some prefer to call it, is opening up, there is greater number of people visiting the country for business and leisure purposes. Most nationals need a visa and there is no way of doing it electronically (July 2012). They were going to launch an electronic visa, but the website that you are supposed to use is down. Bangkok is a great place to apply for various visas. I have done two Chinese visas in Bangkok. Both were handled the very same day and the process was very straight forward. I wrote a piece about it. The number of countries, where one can apply for a visa to Myanmar, are limited due to lack of diplomatic representation. As I was going to be in Bangkok for few days, I decided to do the visa process there. 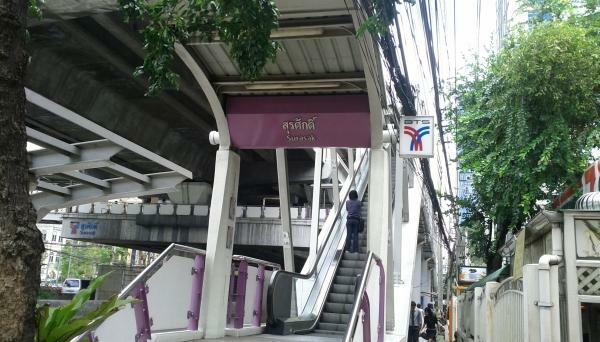 The embassy of the Union of the Myanmar is located close to the Surasak skytrain station. I was sleeping late on that day and missed the 9AM opening, and didn’t get there before 11:45AM that morning. First, I went to one of the nearby copy shop that only business apparently is for people to print out their eticket receipt that is required for the same day visa, copying the info page of your passport, taking the two passport photos that are required for the visa, and place for you to sit down and fill out the required form. I did the all the above mentioned there and the fee was less than 300 THB (around $10). Then, I walked to the visa section of the embassy. The big room was almost empty as the time was getting close to noon. I had to get a queue number from the first window to leave the passport for processing. After I had sat down for couple of minutes, my number came up. Just gave them my visa application accompanied by the passport and the money. I did this on Wednesday and I had a flight coming up on Sunday to Yangon. The regular visa processing time was adequate for me. I was then given a receipt and told to pick up the visa on Friday after 3:30PM. On Friday I went to the embassy just after 3:30PM and there was quite a few other people picking up their visas as well, but the line was very fast. 1. Go to one of the copy shops nearby and have all your documentation ready. 2. No need to go immediately at 9AM unless you need the visa the same day. 3. You can pick up your visa from 3:30PM but I would suggest going maybe 20 minutes later when all the lines are gone. 4. 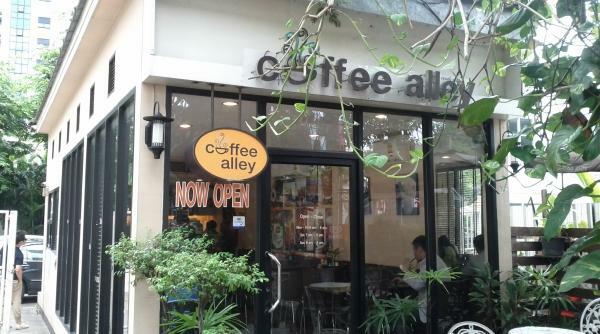 If you are doing the same day visa, you can relax at the Coffee Alley coffee shop that is just outside of the metro station on the same side of the road as the embassy. They have free wireless WiFi there. 5. 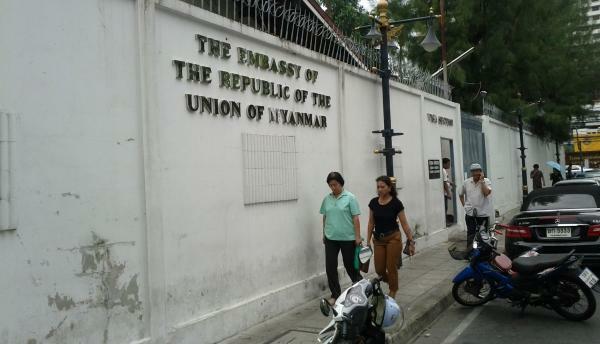 Remember that the embassy is closed on both Thai and Myanmar public holidays. It is always good time to burn miles when airlines temporarily lower the number of required miles. Air France and KLM’s Flying Blue program does this every couple of months. They recently released the list for destination that they have at 50% for July and August 2012. The booking window started on June 28th, 2012. The number of destinations, where these discounted awards are available, is somewhat skimpier than usually. Thing to note is that you can book these also as one way. These are not only for originating from Europe as all the destinations are for both directions. Awards allow the origin/destination in Europe to be in zones 1, 2, and 3, basically meaning that these awards are valid from/to anywhere in Europe. Thing to remember is that Flying Blue charges rather hefty taxes and fees for award tickets. The fees are mainly fuel surcharges (YQ) that they collect. As a result, it rarely makes sense to redeem for an economy class ticket. Also, there are no changes or cancellations of any kind allowed on promo tickets. You either use it or lose it. This award ticket may only be used on connecting flights into or out of the Europe 1, Europe 2 and Europe 3 zones if the connections are to long-haul flights. For European flight promotions, connecting flights within Europe are not included. Discounts (SkyTeam scale applicable) apply to the award ticket price only (SkyTeam scale is valid). Applicable taxes and fees are paid by the Flying Blue member. Business Elite and Economy Elite bookings are available exclusively to Flying Blue Elite members (Platinum, Gold and Silver). These Elite travel classes provide extra award seats on routes to the United States, the Carribean and Indian Ocean, Africa and Asia. US Airways launched a promotion today to celebrate their commitment to the Washington DC area. You need to like US Airways on Facebook or follow Twitter to be first to now about events in the next 30 days. They have also launched a marketing website www.30daysfordc.com dedicated to promote this event. Any itinerary with a Reagan National Airport (DCA) arrival followed by a Reagan National Airport (DCA) departure the same day is considered a connection. There is also ticketing and flying window to get the double miles. Surprisingly no registration is required. Customers must book July 7 – August 5 for travel July 7 – September 30, 2012 to earn double miles on itineraries starting or ending at Reagan National Airport (DCA). Customers with itineraries connecting through Reagan National Airport (DCA) are not eligible for bonus miles. Any itinerary with a Reagan National Airport (DCA) arrival followed by a Reagan National Airport (DCA) departure the same day is considered a connection. Miles do not count toward Preferred status. US Airways will award miles one to two weeks after travel has been completed. All Dividend Miles terms and conditions apply. Hotel Changing Flags or Is Reflagged – What Happens to Paid/Award Reservations? When hotel changes flags or is reflagged, it is rebranded as other chain hotel, or the hotel is becoming independent non-affiliated hotel. This happens numerous times per year at all chains. Both the individual hotel in question and the chain are often contractually not allowed to inform about possible change before it actually happens or at most couple of weeks prior. Here’s what you need to consider if you are holding a paid or award reservation at a hotel that is changing flags/reflagged. The status benefits that you might have had with the original brand no longer apply. If the hotel is reflagged under other global brand with which you have status with, there is no necessarily change i.e. Starwood affiliated hotel moves to Hilton chain and you have Hilton Gold/Diamond status. If you no longer wish to stay at the hotel, you should work with the hotel and request them to cancel the reservation without any cancellation fees. You can always argue that the reason why you chose them in the first place was the affiliation with the previous global brand, and that the change thus is significant. This could be bit trickier as the hotel already has your money, but they tend to be flexible if you decide to cancel. You need to work this out with the property. If the reservation department is inflexible, I would escalate the issue all the way to the General Manager of the hotel. 1. Your award reservation is honored, but you won’t receive any possible status related benefits. 2. Your award reservation is canceled, but the chain is trying to accommodate you at their other nearby property. If the number of required points is higher, this is usually waived. Normally the first sign, that something is going on, is when your reservation disappears from your upcoming reservations display. You might also get a call from the customer service regarding the award reservation you have. Personally, I do care about the miles and points and the benefits that I receive from the programs that I participate to i.e. suite upgrades, club access, early & late checkouts. I really have hard time staying at hotels, where I don’t get any of these benefits. You have to consider all the options on hand and proactively suggest options that suit you best. Hotels and chains are normally very eager to work with you to find an acceptable solution for both parties in a situation like this. This should be nothing new to of my blog. Last month, I wrote about Starwood GPS’s (Global Personalization at Starwood) initiative to spy SPG member on their Facebook, LinkedIn, FlyerTalk et all profiles to “enhance” the stay experience. Now, British Airways has started similar ‘Know Me’ initiative. Some flight attendants are armed with iPad’s that they are supposed to use to Google photos of the passengers to offer them more personalized service like welcoming them on board using their name etc. Also these iPad’s have information about passengers past and forthcoming flight activity and possible problems that they have reported previously. There has now been number of pieces written on the British media about this including Evening Standard & Daily Mail. Even the Fox News picked up the story in the United States. As was the case with the Starwood, I wouldn’t mind if I had given an explicit permission for BA to snoop me on Google et al. I do think, however, that the time would be better spent by enhancing the customer experience on the ground and on the board. It has been an interesting 6 months so far in 2012. My original plan was to stay somewhat still, but something went wrong along the way to say the least. First though, I was totally grounded for the entire month of January. The traveling didn’t start before the beginning of February, but somehow I managed to rack up close to 116K flown miles so far this year. The counties visited, not just transferred, so far this year are United Kingdom, Japan, China, Thailand, New Zealand, Fiji, Western Samoa, Indonesia, Malaysia, Singapore, Cambodia, UAE, Hong Kong, Macau, Sri Lanka, Italy, Vietnam, Philippines, Qatar, and Australia. I had been to all of these before except Fiji and Western Samoa. The number of counties that I have been so far is around 70. Both Fiji and Western Samoa were interesting. I didn’t care too much about the tourist ghetto that the Denarau in Fiji is, but once you go further out to Natadola Bay and to the capitol of Suva, the situation completely changed. Suva was a bustling and interesting city. Obviously Apia, the capital of Western Samoa, was nowhere near as busy as Suva, but it was equally interesting place. The smaller the island the more hospitable the people tend to be. The mix of airlines that I flew on the first half is quite interesting: Lufthansa, Virgin Atlantic, ANA, Thai, Air New Zealand, Air Pacific, Emirates, China Eastern, Blue1, Ethiopian, Gulf Air, Qatar, Asiana, Bangkok Airways, Firefly, KLM, & Malaysian. The number of segments flown was 54. The shortest one was from Helsinki to Stockholm on Blue1 in economy (award) 249 miles and the longest one from Dubai to Melbourne in first class (paid) on Emirates 7231 miles. This goes to against what I normally preach; redeem for business/first and pay for economy. But there are always exceptions to the rule. This year I have somewhat unusual mix of hotels. Last year I had qualified for the Hyatt Diamond by the end of February, but in 2012 I have had only one paid Hyatt stay so for. For the first time ever, I requalified for the Hilton HHonors Diamond status first. This was partly due to free night certificates from a last year’s promo that I have used this past spring. The number of Starwood stays is down significantly as well, although I have almost requalified for the Platinum status. I won’t, however, have nowhere near as many stays this year than I had in 2011 (around 110) or 2010 (around 130). I had quite a few nice InterContinental stays in Ho Chi Minh City, Manila, Koh Samui, Fiji, Phnom Penh and Abu Dhabi. The former Nikko hotel in Kuala Lumpur that was rebranded as InterContinental Kuala Lumpur was the only InterContinental that doesn’t treat Royal Ambassador members well. I stayed also at the Holiday Inn Suva that was to my surprise a nice hotel, and at the Crowne Plaza in Abu Dhabi that had Molton Brown bathroom amenities on the suite that I received there. The Holiday Inn Sharjah was like a flashback from the 80’s or 90’s as was the Crowne Plaza Kuala Lumpur. The first half was full of nice Hilton chain stays; Conrad Bangkok (not my favorite), Conrad Hong Kong (so so), Conrad Macau (fabulous), Conrad Singapore (very nice), Conrad Bali (always take good care of me), Conrad Koh Samui (good but not perfect), Waldorf Astoria Shanghai on the Bund (perfect), Cavalieri Waldorf Astoria Collection hotel (great), Hilton Auckland (good), Hilton Fiji (nice as well), Hilton On The Park Melbourne (good), Hilton Colombo Residence (good), Hilton Colombo (good), Hilton Shanghai (ok), Hilton Narita (bad), Hilton Singapore (good), Hilton Baynunah (ok), Hilton Al Ain (ok), Hilton Doha (good) & DoubleTree Kuala Lumpur (fabulous). Hyatt hasn’t done too much for me lately, but the new Park Hyatt Ningbo was very nice as well as was the Grand Hyatt Jakarta. I also stayed few days at the Hyatt Bali in Sanur and Hyatt Casino hotel in Manila. In Melbourne I revisited both the Park Hyatt and the Grand Hyatt hotels. The Park one is still my favorite of the two. I got a food poisoning during my stay at the Grand Hyatt Erewan in Bangkok. The stay at the Grand Hyatt Macau on my birthday was a complete disaster check in taking over an hour. Unfortunately, the newly renovated Park Hyatt Sydney didn’t impress me and the situation with the Park Hyatt Shanghai was the same. The two Fairmont properties that I went two Fairmont Peace hotel in Shanghai and Fairmont Bab Al Bahr in Abu Dhabi were both stunning on their own ways. Had quite a few Starwood stays as well in the first six months of 2012. The worst one by far was the Sheraton Heathrow hotel. What a piece of crap. Le Meridien Jakarta was quite nice and the Le Meridien Bangkok has never failed to take good care of me. Sheraton Saigon Hotel & Towers (good), Four Points Bangkok (ok), Royal Orchid Sheraton (good), the brand new Westin Ningbo was great, Westin Kuala Lumpur (ok), Le Royal Meridien Abu Dhabi (good), Westin Sydney (good), Sheraton Imperial Kuala Lumpur (good), Sheraton Shanghai Hongqiao (good), Le Royal Meridien Shanghai (very nice), Sheraton Shanghai Pudong (good), The Hongta Hotel Shanghai former St Regis (good), Sheraton Shanghai Hongkou (very good) & Sheraton Fiji (ok) were other Starwood hotels that I spent a night or two in the first six months of 2012. I have never quite understood Accor’s brand and decided to familiarize myself with them. Stayed at the Muse MGallery collection hotel in Bangkok (very good), Mercure Nadi (terrible), Novotel Suva Lami Bay (good) & Pullman Legian in Bali (good). I have to say that I am continuing to be confused. Not quite sure what to expect. Maybe I need to have few more Accorhotel stays later in the year as well. Only had two stays with the Carlson hotels in the first half. Somewhat unsatisfactory stay at the Radisson Blu Denarau resort in Fiji and an acceptable stay at the Radisson Suites in Bangkok. Marriott got some of my business on the first half as well. JW Marriott Kuala Lumpur (very nice), Renaissance Kuala Lumpur (nice), Renaissance Bangkok (very nice), JW Marriott Bangkok (very nice), Courtyard Bangkok (nice), Renaissance Doha (good), Putrajaya Marriott (ok) & Marriott Executive Apartments Sathorn Vista Bangkok (good). The first six months of 2012 was quite a ride after all. The 3rd quarter of 2012 looks equally busy, and I am very excited to visit both the Easter Islands and French Polynesia for the very first time. Best Western just emailed about a promotion that started on July 1st and ends on August 31st, 2012. You will receive 1000 bonus points for (both stays) every two unique Best Western branded hotel stays in South America (Argentina, Brazil, Chile, Colombia, Peru, Suriname, Uruguay and Venezuela). You need to register for this promotion before your stays. According to the terms of this promotion it is only valid for bookings made at the Best Available Rate. Best available rate is NOT often the most economical so it pays to check all rates, whether they are qualifying for this promotion or not. You can earn this offer multiple times. This offer is valid for Best Western Rewards members in the United States, Canada, and the Caribbean in addition to the participating countries listed above. The terms and conditions of this promotion of this promotion are somewhat contradictory. At one point is says that you will receive 1000 bonus points for BOTH stays and then next that you will receive 1000 bonus points for every TWO stays. Also, the start of this promotion is June 1st or July 1st,although that doesn’t make difference at this point as we are already in July. Best Western Rewards® members (“Member(s)”) residing in the U.S, Canada, the Caribbean Islands or at any participating country† who BOOK THE BEST AVAILABLE RATE and completes at least one (1) qualified stay* in 2 different unique Best Western branded hotels in South America (participating country†) between July 1 and August 31, 2012 (“Promotion Period”) will receive 1,000 extra bonus points for both stays. Members will receive 1,000 bonus points for every two (2) qualified completed stays. Each stay must be at a unique Best Western hotel to earn the bonus points. No limit to the number of bonus points awarded during the promotion period. *A “qualified stay” for the purpose of this promotion is defined as one or more consecutive nights at the same Best Western hotel at a rate eligible for earning points or airline/partner rewards through best western rewards. Only one (1) check-in/check-out permitted per qualified stay. Other restrictions may apply. Offer not valid with any other promotion or discount. Promotion is subject to cancellation or change without notice. Please allow 2 – 3 weeks for posting of bonus points. All Best Western Rewards program rules apply. See www.bestwesternrewards.com for additional program terms. Each Best Western® branded hotel is independently owned and operated. Best Western and the Best Western marks are service marks or registered service marks of Best Western International, Inc. ©2012 Best Western International, Inc. All rights reserved. †Participating Countries include: BWR South America Club are: Argentina, Brazil, Chile, Colombia, Peru, Suriname, Uruguay and Venezuela. To enter this promotion, you must be a Best Western Rewards® member. You can only book the Best Available Rate to get the 1,000 bonus points. You must stay for a minimum of 1 night in 2 different “unique” Best Western branded hotels in South America (Argentina, Brazil, Chile, Colombia, Peru, Suriname, Uruguay and Venezuela) between July 1 and August 31, 2012 in order to receive 1,000 extra bonus points for every 2 qualified completed stays. Each stay must be at a unique Best Western hotel to earn the bonus points. No limit to the number of bonus points awarded during the promotion period. This offer is valid only for stays during June 1 and August 1, 2012. Cancellation of your booking means you will not receive your 1,000 extra bonus points. Priority Club is giving 500 bonus points for their Priority Club Shopping email sign ups. It is fast and easy. I just did it myself. Just click the link and give Priority Club Shopping permission to start sending you shopping related emails. Wait until the bonus points post and then you can unsubscribe if you so wish. 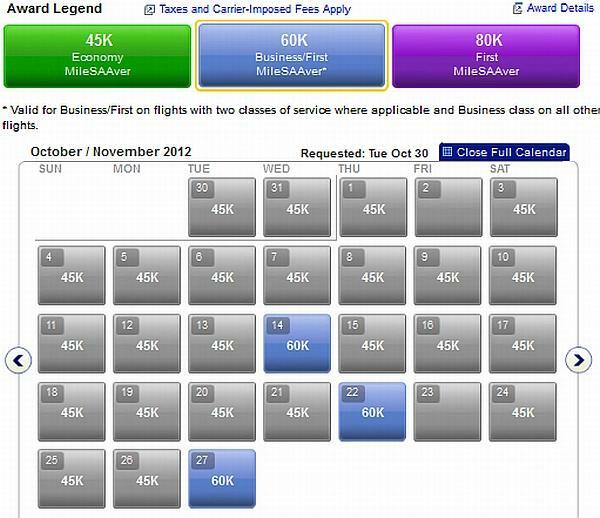 American Airline has been slowly extending the number of partner airlines that can be booked on AA.com. Earlier this year American Airlines made Hawaiian and British Airways award flights bookable on AA.com in addition to Alaska ones. 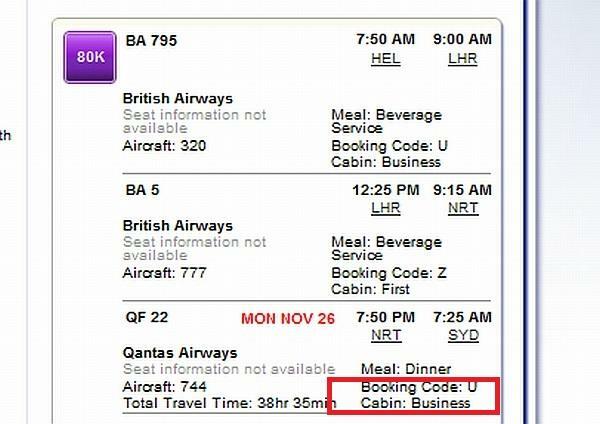 Now you can also book awards including Qantas flights on AA.com. 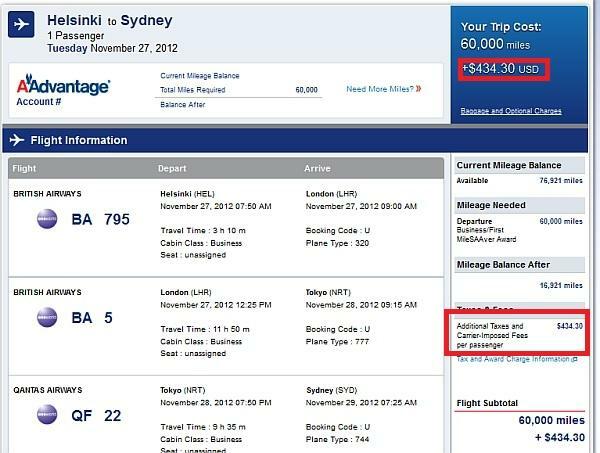 I decided to test this by searching for award availability from Helsinki to Sydney. The economy awards appear to be wide open in the month of November. Searching for business class only returns availability on three days. First class is also available for about half of the dates. The fare engines returns number of flights with connection from British Airways to Qantas or Qantas to Qantas in Singapore, Hong Kong, Shanghai and Narita. You have to be careful with the flights, however. The engine returns quite a few combinations where the second long haul is in fact in business class and not in first. The feeder flight from Helsinki to London only has economy and business class. As a matter of fact the AA’s engine was not able to return a single date in November from Helsinki to Sydney in first class. I was finally able to find one itinerary that was pricing correctly in business class on all of the three segments in question. I don’t like the way the AA hides “carrier imposed surcharges” and doesn’t provide a clear breakdown of taxes and fees. 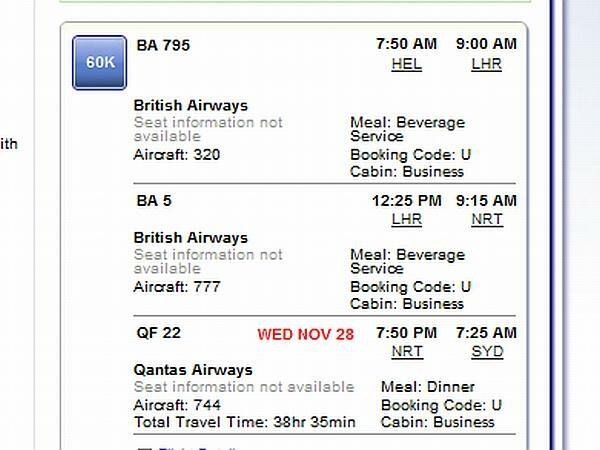 Probably around 70% to 80% off that fee are the fuel surcharges of the BA’s Helsinki to London and London to Narita segments. It is great to have more AA partners bookable online without having to call the reservations. AA now has four partners online and quite a few to go before you can book as complex itineraries as one can on United.com. Expedia is running a gas card promotion with select hotels. You need to book by August 31st, 2012 and stay by September 30th, 2012. You will receive $25 gas card for stay of $150 to $249, $50 gas card for stay of $250-$449, and $100 gas card for stay over $450. There are close to 400 hotels in United States, Canada, and Mexico that participate to this promotion. You can use the following link to check the prices, or you can just do a search, and the hotels that are offering this deal are marked by “Expedia Extras” icon advertising this offer. Last year Expedia has a similar promotion that was valid at most hotels worldwide, and I was able to get a gas card out of it. Essentially this is about 20% discount if you can find a competitively priced hotel at that $450 mark. Once you have booked any of the participating hotels, you need to go back to your account and choose the gas card and fill out the relevant info for Expedia to fulfill the offer. You will receive the gas card few weeks after your stay in a mail. Special offers are only available at participating hotels. Prices shown above include applicable discount. Hotel savings are based upon Expedia’s everyday hotel rates, excluding taxes and other fees. Minimum stay may be required. Pricing may vary based on travel dates and length of stay. Offers are subject to availability and may be discontinued without notice. Additional restrictions and blackout dates may apply. Up to $100 Prepaid MasterCard® debit card is available on standalone hotel at qualifying Expedia Special Rate (ESR) hotels only. Qualifying hotels will show offer on search results. Book between 05/15/2012 and 08/31/2012, with travel completed by 09/30/2012. Minimum purchase is between, $150 and $249 total, before taxes and fees for a $25 Prepaid MasterCard® debit , $250 and $449 total, before taxes and fees for a $50 Prepaid MasterCard® debit, and $450+ total, before taxes and fees for a $100 Prepaid MasterCard® debit. One card issued per qualified itinerary. To receive a Prepaid MasterCard debit card you must complete the offer redemption form located at the bottom of your itinerary and provide a shipping address. Card will arrive 4 to 6 weeks after travel completion. Limit one Prepaid MasterCard debit card per booking and per person during promotion period. To be eligible, you must be a US resident, at least 18 years of age or older, you must make a qualifying booking, and you must complete your stay at the booked hotel. Shipping to the 50 states, District of Columbia and US territories only. Not redeemable for cash. If you cancel your hotel or vacation package you will forfeit your prepaid card. The $25, $50, and $100 Prepaid MasterCard® debit cards from Expedia are issued by First California Bank (FCB) pursuant to a license by MasterCard International Incorporated. MasterCard and the MasterCard Brand Mark are registered trademarks of MasterCard International Incorporated. Fiserv Solutions, Inc. is a registered MSP of First California Bank. The Prepaid MasterCard debit cards from Expedia can be used wherever MasterCard debit cards are accepted, and use is governed by the terms in your Cardholder Agreement, which you will receive with the card. Expedia reserves the right to substitute this offer with an offer of equal value at its sole discretion without prior notice. This offer is nontransferable, not redeemable for cash and void where prohibited. Expedia and its suppliers are not liable for any loss or damage to any person or property in connection with redemption or use of this offer. The use by Expedia of third-party trademarks or product names does not imply that any such third party endorses, sponsors, or is otherwise affiliated with Expedia or this offer. American Airlines has two mileage promotions going on at the moment. You need to register for both of these before travel. Note that the Cathay Pacific offer is only valid for business and first class while the offer to Helsinki also applies to high coach fares. This is about the best time of the year to visit Helsinki, where I used to live for 6 years. There is enough to do and explore for several days and you can always take a ferry or helicopter to visit Tallinn in Estonia as well. Helsinki is the world’s design capital in 2012. You can read more about this on the following website. You need to register for this offer prior traveling. This offer is valid for travel from June 26th, 2012 to September 30th, 2012. There is no ticketing date restriction on this offer that is also valid on Finnair, BA, and Iberia codeshares. Cathay Pacific is offering bonus miles for their flights to Hong Kong from United States and Canada for AAdvantage members. The bonus miles only apply for first and business class cabins. You need to book the travel by July 31st, 2012 and travel must be completed by August 15th, 2012. You need to register for this offer prior traveling. Fly Cathay Pacific roundtrip from Chicago, Los Angeles, New York, San Francisco, or Vancouver to Hong Kong on a qualifying First Class ticket between June 15, 2012 and August 15, 2012 and earn 10,000 AAdvantage bonus miles. Or, fly on a qualifying Business Class ticket and earn 8,000 bonus miles. There is no limit to the number of bonuses you can earn during the promotion period and the bonus miles are in addition to your standard base miles and class of service bonus. Just book your trip between June 15, 2012 and July 31, 2012 and register prior to travel. Register today by selecting the red “REGISTER” button below. Book your trip between June 15, 2012 and July 31, 2012. Travel on/between June 15, 2012 and August 15, 2012. AAdvantage bonus mileage offer is valid for round-trip travel on nonstop American Airlines operated flights between Chicago O’Hare and Helsinki, Finland from June 26, 2012 – September 30, 2012. Includes travel on codeshare flights marketed by British Airways, Iberia or Finnair. This promotion is only valid for AAdvantage members who purchase and fly on published fare tickets booked in J, D, I, R, Y, B, H, K, L or M. Bonus will be awarded based on the booking class purchased. Bonus miles do not count toward elite status qualification or Million Miler status. Registration prior to travel is required. The offer applies to F, A, J, C, D and I fares only. Offer valid on Cathay Pacific operated flights for travel with an American Airlines or Cathay Pacific flight numbers, between JFK/LAX/ORD/SFO/YVR – HKG only. Two one-way flights booked in different reservations are not considered a roundtrip. Travel must be completed between June 15, 2012 and August 15, 2012. Offer is not combinable with any other offer. Offer for AAdvantage U.S. residents only. 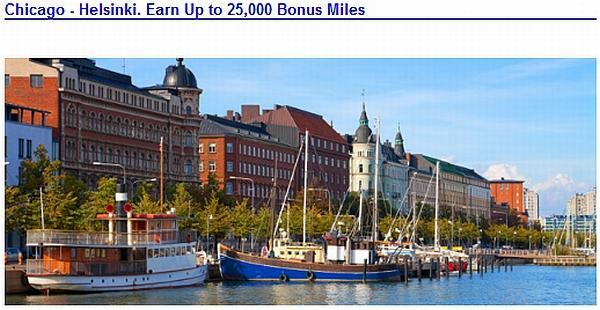 AAdvantage miles must be earned for flights to qualify for the bonus. Bonus miles do not count toward elite-status qualification. Registration prior to travel is required using Promotion Code CXS12 at www.aa.com/offers. Cathay Pacific reserves the right to change or terminate the offer without prior notice. Hilton and Delta have teamed up offering triple Delta SkyMiles for stays at selected Hilton family of hotels from July 1st to September 20th, 2012. You need to register for this offer in advance and have Delta as your Double Dip airline partner. This offer is combinable with the current Triple Your Trip-promotion for double points for weekday nights and triple for weekend ones. The number of participating properties is around 316 of more than 3700 Hilton family of hotels worldwide. If you are planning to take advantage of this promotion, you should read the list of participating hotels very carefully. The number of Delta Air Lines SkyMiles that you earn from your Hilton stays is dependent of the brand in question. The table below is the fixed mile option. You can also choose variable miles that is one mile per eligible USD spent before promotion is factored in. You may want to consider crediting to Virgin Atlantic, if your earning preference is to maximize Hilton HHonors points. You can read more about this strategy here. To be eligible for this offer, you must (1) select Delta Air Lines as your preferred Double Dip® Points & Miles™ Partner in your Hilton HHonors™ account profile, (2) complete a stay at a participating hotel or resort in the Hilton Worldwide portfolio from July 2, 2012 through September 30, 2012, and (3) register online at www.HHonors.com/DeltaTriple prior to check-out. You must be a Hilton HHonors member to earn Points & Miles for hotel stays. Triple Delta Air Lines Miles (Both Fixed and Variable Miles members): Earn triple miles with the Delta SkyMiles® program per qualifying stay at a participating hotel or resort in the Hilton Worldwide portfolio. Reward stays are not eligible for this offer. There is no cap on the miles that may be earned during the promotion period. Miles are not eligible to earn Medallion Qualification Miles. Allow up to six weeks after qualification, and after promotion has ended, for miles to be credited to your account. This offer may be combined with other offers and/or promotions. All SkyMiles program rules apply. To review the Delta SkyMiles full Terms & Conditions please visit delta.com/skymiles. Hilton HHonors™ membership, earning of Points & Miles™ and redemption of Points are subject to HHonors Terms and Conditions. Priority Club just released a list of last minute reward nights for this coming weekend. You need to book them on Tuesday, Wednesday, and Thursday for Friday, Saturday, or Sunday nights this coming weekend. These last minute rewards nights are offered at 50% discount of the usual number of points needed. This time they have 88 hotels on the list of which 11 are InterContinental hotels. There are 51 hotels in the United States and 21 in China on this list. Sometimes there are good values on the Last Minute Rewards list, but nothing really caught my eye this time around. 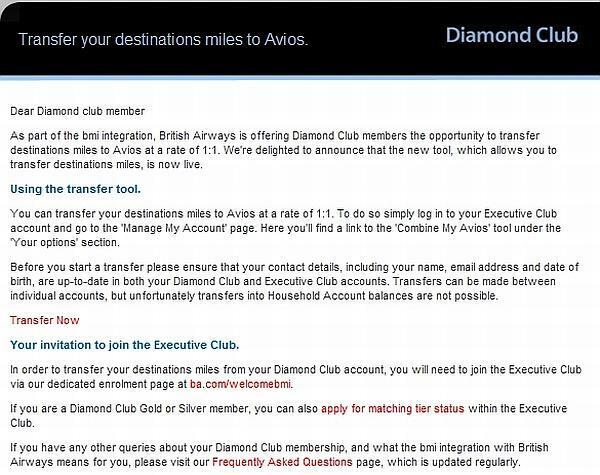 British Airways and BMI announced back in May that you could transfer BMI Diamond Club miles to British Airways Avios and vice versa starting on July 3rd, 2012. BMI just sent an email explaining the process. I already did the status transfer from BMI (Gold) to British Airways (Gold) last month and that process was flawless, although not instantaneous. The status transfer took only few days. I decided to check out, how I could transfer some Diamond Club miles to Avios now that the transfer too is up and running. 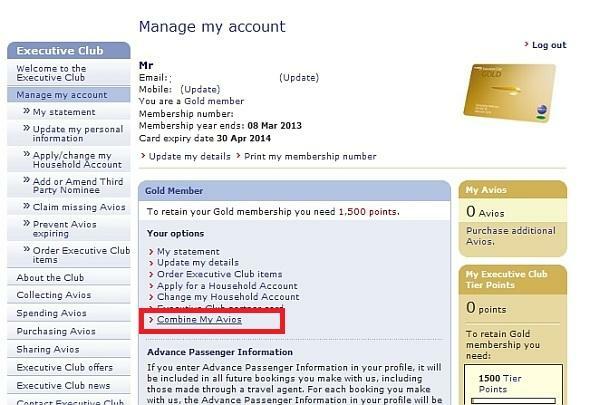 First, I had some trouble finding the “Combine My Avios” link on my “Manage My Account” section of BA’s website. The screen informing about the process was very straightforward and I decided to proceed. Next I was prompted to fill out my BMI Diamond Club number and associated password. And then I was hoping for the best…. Here the problems started. The BA’s website just returned page not found-error message. Decided to try again. This time combining Avios not available-error message popped up. I thought that for sure BA and BMI had tested this few times before releasing and was presented yet another error message. This time my combining Avios was supposedly already open. Maybe the problem was Firefox? No. Internet Explorer returned the 404 page as well. Oh well. Nothing happening around BMI and BA can surprise me at this point. I am sure that the tool will be up in a day or two, but getting this right from the get-go shouldn’t have been too big of a task.